SALE Starting at $769 More Finishes. Same Price. SALE Starting at $819 More Finishes. Same Price. A simple and stylish way to add more seating to your dining room is to add a set of matching dining benches. A warm, natural wood bench set can make guests feel at ease and comfortable in their new surroundings. Our dining room benches are the perfect way to add multi-functional seating to one of our Bench*Made dining tables. Benches are also great in halls, foyers, and mud rooms. Adding character to any space can be made simpler by adding solid wood dining benches. There are plenty of places to shop for benches, too. But with so many styles and choices, where do you start? At Bassett, we make it easy for you to find the durable, well-crafted and attractive bench you’re looking for without having to spend a fortune in time or money. Finished right here in Bassett, Virginia, our Bench*Made line of solid, wood benches combine extraordinary beauty with substantial durability. 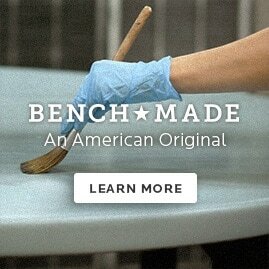 Made one at a time by our master craftsmen, Bench*Made dining room benches are created without the use of an assembly line. Each dining bench is made by artisan furniture makers with painstaking care exactly to your order. Wood is sourced here, too. From top to bottom, beginning to end, your bench is handcrafted with pride and integrity. Visit one of our many furniture showrooms and browse our current collection of beautiful, solid wood dining benches. While our incredible selection makes finding the perfect bench easy, you may not find the ideal style for you. That’s where our custom design program makes your life even easier. Speak with one of our custom design consultants about the myriad of options available through our custom design program. Create your own bench from start to finish. With so many finish options, we’ll create the perfect matching benches for your home decor.